The GS1 Cannulated Screw System includes Multi-Axial Screws, Rods, and Cross-Connectors. The Multi-Axial Screws allow for 28° (56° total) of angulation in any direction and are available in multiple diameters and lengths with clearly marked sizes. Extended break off tabs eliminate the need to attach bulky towers and provide a built-in reduction feature. 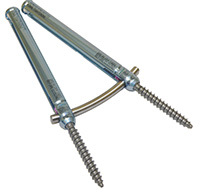 Screws are easily placed over a guide wire in either an open or percutaneous method. A Torque-Limiting Driver ensures all set screws are tightened correctly for the strongest fixation.